For some reason I can’t find Wallflower Fragrance Refills in any of the Bath and Body Works stores in Kuwait. At one point, I even thought Bath and Body Works had straight up discontinued them. Now, even if I do find any, they are usually only limited to Sweet Pea (floral), Fresh Linen (clean), Dark Kiss (fruity), and Warm Vanilla Sugar (gourmand). I feel like I’m missing one or two more scents but these are all I can remember off the top of my head. In any case, if I can’t even remember what they were called then I’m pretty sure they weren’t that impressive to begin with. So yeah, I don’t know what’s up with Bath and Body Works and Wallflower Fragrance Refills in Kuwait but I sure hope they aren’t phasing them out… One store straight up didn’t have any! I finally came across these and picked up Warm Vanilla Sugar (x4) and Dark Kiss (x2). Warm Vanilla Sugar: Inspired by the sweet indulgence of sheer florals, vanilla absolute & sandalwood. 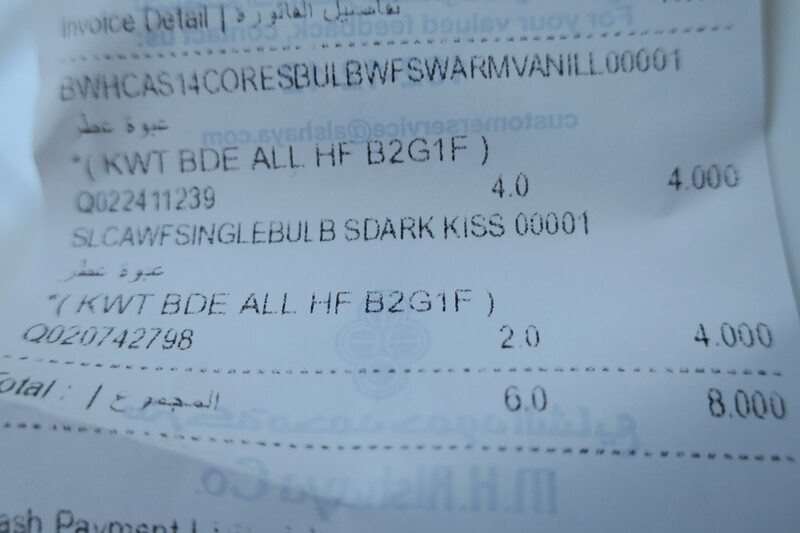 I only picked up 2 Dark Kiss Wallflower Refills because those were the only 2 I could find. It’s an addictive scent that’s currently plugged in my closet area to scent all my clothes. As for Warm Vanilla Sugar, it’s a mild vanilla scent that is somewhat masculine and strikes me as quite soap-y actually. I’ve plugged Warm Vanilla Sugar in my living room (in lieu of Vanilla Bean Noel which obviously I couldn’t find) and although it’s not as blatantly gourmand, I still find it to be a pleasant scent that strongly reminds me of soap. That said, I wish Bath and Body Works would have more scents from the Signature Collection as well as the Limited Edition Collections so we could have some variety (and not get bored of the meager selections available in Kuwait). Actually, since I’m throwing it out there, I really wish Bath and Body Works would start selling Fragrance Melts and Fragrance Melt Warmers, preferably with a three-headed plug (BS 1363 UK plug) that’s actually compatible with the electric sockets in Kuwait. I actually picked up a handful of Fragrance Melts from a random store on my most recent vacation abroad but skipped the Fragrance Melt Warmer because it was incompatible with our electricity. I figured I could just MacGyver my own Fragrance Melt Warmer back in Kuwait (using a Fondue Set… it seemed like a good idea at the time) but that didn’t happen. 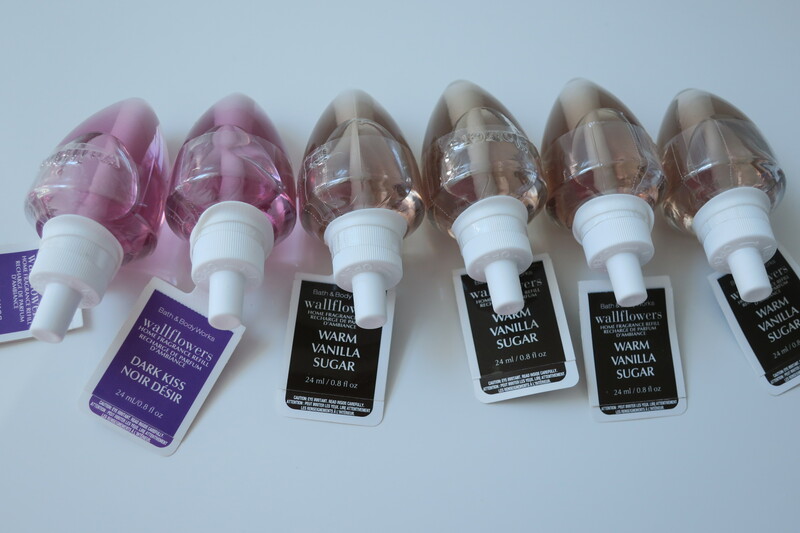 I picked up all 6 Wallflower Fragrance Refills for KD8/000 since there was a Buy Two Get One Free deal on them.